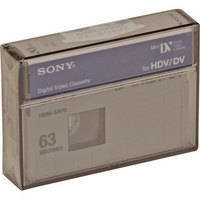 The Sony HDM63VG Videographer Grade 63 Minute HDV/Mini DV Tape offers high quality, reliable recording at a reasonable price. It is recommended for Mini DV and HDV recording such as in use with professional HDV camcorders. The tape has fewer dropouts, which means fewer errors, resulting in improved tape stability and picture quality. The single layer AME-II tape technology provides a cleaner signal during playback.